Many interesting stories of how Michael came to Australia have been handed down through the various branches of his descendants. Each of these stories has been checked, but no records can be found to verify them. No ships carrying either assisted or unassisted immigrants to Australia listed a Morton from Tipperary, or anywhere else in Ireland. The vast majority of Mortons came from England or Scotland. Only two other Michael Mortons have been found in all of the record checking carried out-one an Englishman who arrived with his wife Sophia and infant son John in the 1850s-the other a convict transported to Van Dieman’s Land in 1822, six years before our ancestor was born. During 1988, the Irish Government presented Australia with a Bicentennial gift-a computer data base containing records of all Irish people transported to Australia between 1837 and the early 1850’s when the transportation system ended. We are indebted to Lyn Mc Innes for her discovery of this information in Latrobe library. Lyn maintains that she leapt up and shouted “Eureka” when Michael’s name appeared on the monitor screen. The next step in verifying that this man was our ancestor was to discover where the ship went-a task made difficult by the fact that there were seven “MEDWAYS”, six of which had come to Australia at various times. None of these ships however had brought a Michael Morton here. 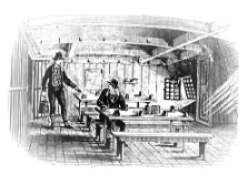 “Bound for Australia”, a book by David Hawkings, along with some British Home Office records on microfilm at the Victorian State Library, led to the discovery of the particular “MEDWAY” into which Michael had been herded in November 1847. Following his sentencing, it is most likely that Michael was transferred from Nenagh to the convict prison on Spike Island in Cork harbour to await embarkation. Commissioned as a convict ship in October 1847, the “MEDWAY” took her human cargo aboard a short time later, probably at Cork harbour. She set sail for Bermuda on November 10th. 1847, having ridden out a severe storm two days before. Several other ships had broken their moorings and collided, causing much damage. “MEDWAY” appears to have survived the storm unscathed. After a journey of some three months, the “MEDWAY” berthed at the wharves at Ireland island in Bermuda. As she was to be converted to a floating prison “Hulk”, her prisoners were immediately moved to other accommodation. Records show Michael was transferred on Feb.9th. 1848 to the “THAMES”, a twenty five year old hulk, destined to sink at its moorings there in June 1863. He was returned to the “MEDWAY” about nine months later, presumably when the conversion was complete. Most hulks used as long term gaols were made by stripping the ships superstructure and replacing it with a two or three level dormitory style building with kitchen, mess hall, ablution block and chapel. Convicts had been working in the dockyards and quarries of Bermuda since 1824, and from 1846 onwards much labour had been used to extensively alter and add to the fortifications of the islands. The English were afraid that the Americans planned to attack Bermuda to capture convicts to add to their slave numbers. The British Home Office required the Supervisor of each hulk to make a quarterly report on each prisoner, and it was during his stay on the “THAMES” that Michael Morton became Michael Moreton – a misspelling that remained in his records until his arrival in Australia. These quarterly “hulk returns” provided the information that allowed the next stage of Michael’s journey to be discovered. Earl Grey of the British Colonial Office keenly supported the idea of allowing well behaved prisoners to be selected for resettlement in the colonies as “Exiles”- an Exile being a prisoner accepting the option of serving his or her sentence as a free person in a colony. He also maintained that many convicts, particularly the Irish, were not criminals, and should be seen for what they really were, political activists. Grey had an ideal opportunity to put these ideas to the test when, in May 1848, it was decided to dispatch 600 convicts to the Cape of Good Hope. They were to build a breakwater in Table Bay. 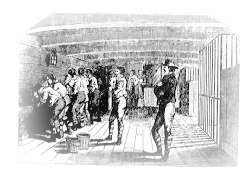 In August of that year, Grey proposed that these convicts be exiled to the Cape, and immediately directed that 300 political offenders in Bermuda should be sent there. In a letter to the Administrator of the penal colony at Bermuda, Grey refused to accede to a request that these prisoners be sent to the Cape at no charge to themselves. He ordered that each should pay ten pounds for his passage to the Cape. Presumably this fee was deducted out of any money the prisoners earned whilst working for their jailers! “NEPTUNE” was a 35 year old sailing ship of some 644 tons built in Calcutta in 1814, and the fourth convict transport ship to carry that name, the first being the infamous vessel which was part of the Second Fleet of 1790. An unusually large ship for those days of 809 tons, she gained her notoriety by having 161 of her cargo of 500 convicts die on the journey. Michael’s “NEPTUNE” was always referred to as a “ship” which meant that it was a “full rigged” or “square rigged” vessel with three masts. She had been used only once before as a convict transport – this being in 1838 when she brought 350 male prisoners to Hobart. “NEPTUNE” sailed from Bermuda on the 24th. of April 1849. For this journey she was under the command of Captain Henderson. The surgeon entrusted with the formidable task of keeping “passengers” and crew alive and as healthy as possible, died before they reached the Cape. He was replaced by Surgeon Superintendent Thomas Gibson on their arrival. Being put on a Ticket of Leave meant that on their arrival at the Cape they would be handed the “Ticket”, which would allow them to work for themselves in any spare time they had outside their required convict labours. The people of the Cape colony were violently opposed to these arrangements, and in June 1849, well before the arrival of the “NEPTUNE,” had formed an Anti Convict Association to lobby the Colonial Office against the move. After making a brief stop at Pernambuco on the east coast of Brazil on July 18th. to replenish water and supplies, the “NEPTUNE” dropped anchor in Simon’s Bay at the Cape on September 19th. 1849. By this time opposition to the landing of these men had reached hysterical proportions in the Cape colony and they could not disembark. The colony refused provisions, medical supplies and water to the “NEPTUNE,” all of which had to be obtained from Mauritius. Grey came under increasing pressure to abandon his plans and eventually bowed to the wishes of his opponents, both in England and the colonies. On February 13th. 1850, some five months after arriving at the Cape, he ordered Captain Henderson to take the ageing “NEPTUNE” on her second voyage to Van Dieman’s Land. 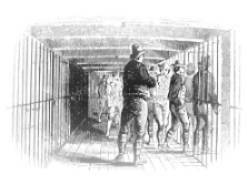 In the flurry of activity preceding the departure, people from the mainland were deployed in helping with the stowing of materials and provisions on the “NEPTUNE.” She sailed with 282 convicts (18 had died since leaving Bermuda), 43 troopers as guards, and 6 paying passengers. The number of crew is unknown. Entry (Dated 19th.February) in the diary of John Mitchel, one of the prisoners on board the “NEPTUNE”, and a well known political activist for the freedom of Ireland. Much of Mitchel’s diary writings are included in the book “The Gardens of Hell” edited by Peter O ‘ Shaughnessy. 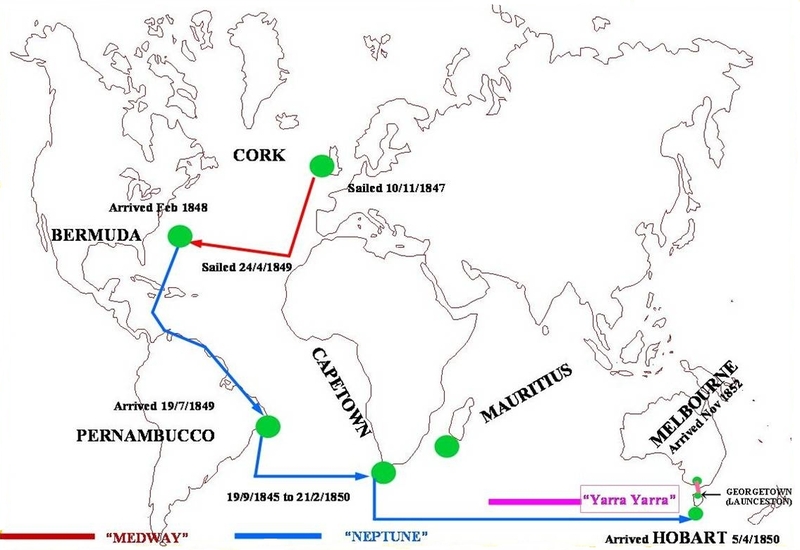 It is possible that “NEPTUNE” did not clear the Cape until the 21st., as this is the departure date shown in the shipping movements columns of the “Hobart Town Gazette” and “Argus” newspapers of the day. The unfavourable winds mentioned by Mitchel may have delayed the departure. No doubt Michael and the other sea weary people on board shared Mitchel’s sentiments as they braced themselves for the next stage of their journey. THE “ARGUS” WEDNESDAY APRIL 24th. 1850. Pretty stale news item, “NEPTUNE” arrived Hobart April 5th. Immediately after clearing False Bay “NEPTUNE” steered due south to latitude 46°, where she could run before the strong westerly wind (The Roaring Forties), and ride the Antarctic Drift current. She often covered 200 miles in a day. “NEPTUNE” reached the mountainous southern coast of Van Dieman’s Land in early April. The waters were placid as they rounded the many promontories, wooded to the waters edge. After one night becalmed, the ship made way to the head of the D’Entrecasteaux Channel, taking on a pilot there to guide them to anchor in the Derwent river, a quarter of a mile from the quays and Custom house of Hobart Town. Officials and police were soon aboard, checking the roll and informing the men that they would be landing as free men. Thomas Gibson had kept everybody on board alive to this point, but sadly he died just ten days later at Newtown. All except John Mitchel received conditional pardons, which meant that they gained total freedom on the condition that they did not return to England until their sentence had been served. Mitchel was given restricted freedom with a “Ticket of Leave” requiring him to report regularly to the police. 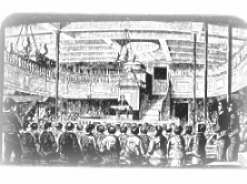 Michael and his fellow passengers received their conditional pardons on Tuesday April 5th.1850. Almost three years after his trial-HE WAS FREE! Michael stayed in Tasmania for about two and a half years, another period in his life which he does not appear to have revealed to his family, who believed that he had lived only in Victoria. This segment of his life was not recorded in any official records or documents (Presumably his convict records were destroyed when he was conditionally pardoned) until he embarked from Launceston on November 8th. 1852 on the “YARRA YARRA,” bound for Melbourne. Goldrushes had begun in many parts of Victoria, and people were flocking to them from all over the world. We do not know whether Michael made contact with his brother John during this time in Tasmania – indeed what happened to John remained a mystery for some time until records of his marriage, birth of his children and his death in Victoria were found in 1993. Michael apparently never knew that John had moved to Victoria-although rumours of the existence of a mystery brother did exist amongst some older family members. Really interesting finding out more about my Great , great , great, Grand-father John Moten who was a brother of Michael Murton. Would be interested to know which of John’s children was your ancestor Terri,and any other bits of info which may be of interest. OK if we place your email address on our reunion list ? Quite a story wasn’t it ? Doesn’t have much important detail as far as I can recall. Are you getting back into the family history ? If you go to the “Books about Waanyarra category on the home page of the website you can follow the links to some chapters of my book “In Neptune’s Wake” which has been updated. I was only able to find a photo of Thomas’ wife Rebecca Briggs Jenni when I was researching “In Neptune’s Wake”. I think I asked all of his family that I could find—none had any photos of Thomas. My 3xGreatfather was ‘The Limerick Scapegoat’, William Frewen, who was on the same journey as your relative and John Mitchel. He arrived on the Neptune in April 1850 and got sent to the Cascades, as he was slightly more aggressive than the others. he eventually got to Melbourne and died in 1881 in Strathfieldsaye after falling off a dray, drunk!